Western blot analysis of extracts from HeLa cells, transfected with 100 nM SignalSilence® Control siRNA (Fluorescein Conjugate) #6201 (-), SignalSilence® Bax siRNA I (+) or SignalSilence® Bax siRNA II #6514 (+), using Bax Antibody #2772 and α-Tubulin (11H10) Rabbit mAb #2125. 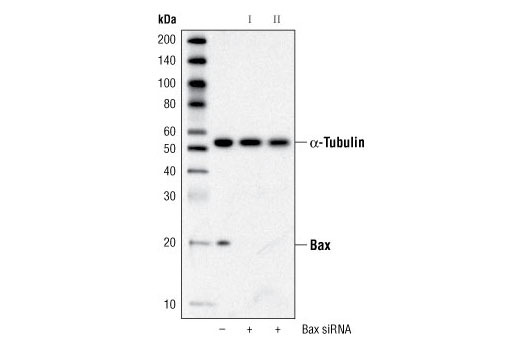 The Bax Antibody confirms silencing of Bax expression and α-Tubulin (11H10) Rabbit mAb is used to control for loading and specificity of Bax siRNA. CST recommends transfection with 100 nM Bax siRNA. 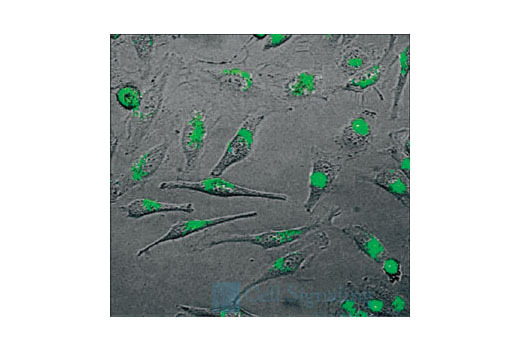 Decreased Bax expression seen 24 hours post-transfection. See Protocol for transfection procedure. SignalSilence® Bax siRNA I from Cell Signaling Technology (CST) allows the researcher to specifically inhibit Bax expression using RNA interference, a method whereby gene expression can be selectively silenced through the delivery of double stranded RNA molecules into the cell. All SignalSilence® siRNA products are rigorously tested in-house and have been shown to reduce target protein expression by western analysis. Bax expression was effectively reduced in T lymphocytes by RNA interference, demonstrating the dependence on Bax to trigger the release of AIF from the mitochondria during apoptosis (5). Bidère, N. et al. (2003) J Biol Chem 278, 31401-11.